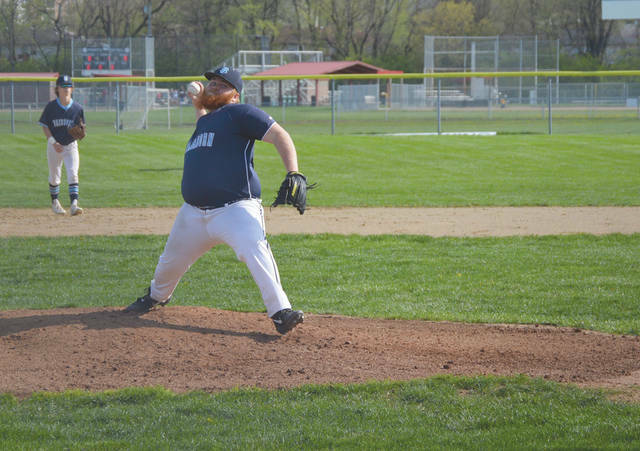 Fairborn senior righthander Andrew Trickett tossed a four-hit shutout against West Carrollton in a boys high school baseball game, April 16 in West Carrollton. Fairborn won the contest, 5-0. Kahlil Lettice watches his hit fall just inside the left foul line for a second-inning hit. Lettice later scored the game’s first run in the inning, April 16 at West Carrollton High School. 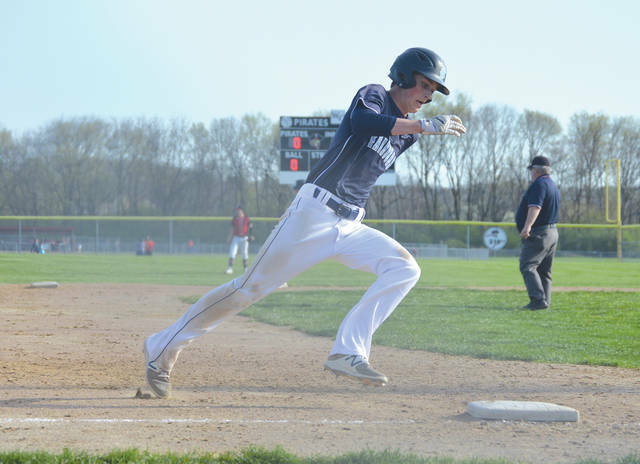 Skyhawks junior Jacob Hobbs races around third base to score the first of four Fairborn runs in the sixth inning of Tuesday’s game against host West Carrollton. West Carrollton’s C.J. DiSalvo swings just under a high pitch for a strikeout, in the second inning of an April 16 game with visiting Fairborn. Nine Pirates batters struckout in a 5-0 loss to Fairborn. 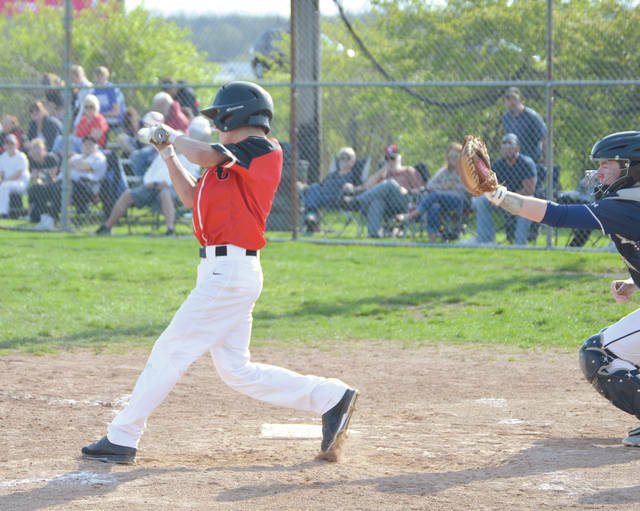 WEST CARROLLTON — In what began as a pitchers duel, Fairborn starter Andrew Trickett found his groove, the Skyhawks found him some runs, and Pirates batters ended up dumbfounded in a 5-0 Fairborn win April 16 at West Carrollton High. Trickett limited West Carrollton (3-11, 2-4 GWOC South) to four hits while recording nine strikeouts to earn his fifth complete-game win of the season. West Carrollton’s T.J. Williams hit a double to left field in the second inning for the Pirates’ only extra base hit against Trickett. West Carrollton stranded six runners on base for the game. While he and Pirates starter Logan Mullins were locked in an early duel, Fairborn provided Trickett with all the run support he needed in the sixth inning. The Skyhawks (7-8 overall, 6-2 in the Greater Western Ohio Conference’s South division) had the lead, 1-0, when Kahlil Lettice got on board with a single just inside the left field foul line. Lettice advanced on a West Carrollton throwing error, got to third on Andrew Yeary’s sacrifice bunt, then raced home on a rare Mullins wild pitch. 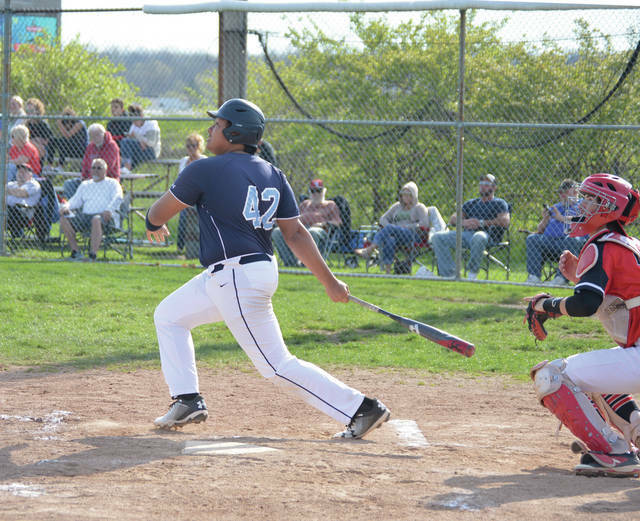 Fairborn then broke the game open in the sixth, however, when Jacob Hobbs, Yeary, Jacob Moore and Jacob Benge all scored. Moore’s single to left drove in Hobbs, Benge’s single to center scored Yeary, then Nate Fasnacht’s drive into center field brought home Moore and Benge. Fasnacht and Yeary each had two hits in the game. Mullins struck out the first three Skyhawks he faced. He recorded six K’s for the game, but none after the third inning. West Carrollton shortstop Noah Martin, who entered the game with the GWOC’s third highest batting average at .649 reached on a first-inning throwing error, but did not get a hit. Pirates coach Adam Murphy said his team wasted too many scoring opportunities in Tuesday’s loss. He said he hopes to rectify that problem when the two teams play again at 5 p.m. on Wednesday April 17 on Fairborn’s ball field. “Mullins pitched a good game for us. We just need to give him more run support. We can’t strand runners like that and expect to win,” Murphy said.